The nine day Tanzania safari tour comprises visits to several national parks in the northern circuit, exploring world heritage sites, cultural tours and visits to Masai villages , and exploration of historical monuments. There is never a dull moment on such a safari trip. The itinerary is family friendly, there is something for everyone to enjoy. Day one is for arrival. You will arrive in Tanzania via planes or bus, clear through immigration and embark on your safari. One of our agents will meet you at the airport and transfer you to Arusha town, where you will spend the night. After an early breakfast, you will be picked up from the hotel and driven to Tarangire national park. Tarangire national park is named after river Tarangire. The river supports the eco system of the park and attracts a large population of game to its banks. There are thousands of carnivores, herbivores and predators in the park. You will be taken on a game drive through the park, and if you have time you can enjoy a guided walk as well. You will have your dinner and spend the night at a lodge in the area depending on arrangements made for you or by you. Tarangire after an early breakfast on day three you will embark on a full day of game drives and exploration in Tarangire national park. Tarangire is famous for its large herds of elephants and giant baobab tree and you will definitely see these and much more. Lunch will be enjoyed in the park, you can carry a picnic lunch. In the evening you will head back to camp, or to your lodge for dinner and a good night’s rest. Day four starts early with a much needed breakfast and then it’s off to Serengeti national park. Serengeti national park is a world heritage site, and one of the extraordinary amazing wonders of the world. The park covers an area of about 5,600 sq. miles and has a variety of wildlife. The name “Serengeti” means endless plains. Exciting animals such as lions, cheetahs, leopards, elephants, are some of what you will see in the Serengeti. Serengeti is also known for the annual wildebeest migration, and depending on the season and timing of your safari, you just might get to see some of the migration action. At the end of the day, you will be taken to a lodge or a camp in the area depending on your preferences and bookings. On day five, you will spend the entire day exploring different parts of the Serengeti national park. After a leisurely breakfast, you will go on a game drive, in the wake of the wildebeest migration, tracing the animals’ path. Every year from My to December, thousands of wildebeests, zebras, gazelles make their way across the east African plains from the Serengeti to Kenya’s Masai mara and then back in search of fresh grazing grounds and water. The migration is quite a spectacle if you manage to catch some of the action. You can also go on guided walks, or visit nearby villages. On day six, you will make the drive to Ngorongoro conservation area. The journey to the conservation area is quite interesting; you can even enjoy a game drive enroute. Still on your way, you could stop by Olduvai Gorge, a historical site in Tanzania which is also one of the most paleoanthropologaical sites in the world. 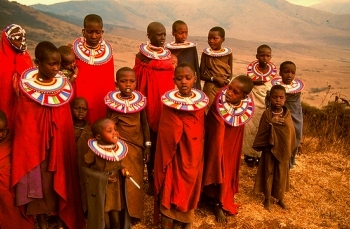 Visit the Maasai villages as well and learn something about the people. You will spend the night in one of the lodges in the Ngorongoro area. On day seven , you will go on a tour of the Ngorongoro crater. Stretching 12 miles in diameter and over 2000 feet deep, Ngorongoro crater has one of the largest concentrations of wildlife in Africa. This is one place where you have a very good chance of seeing all of the big 5. It is also the 8th wonder of the world. A game drive descending into the crater and around the crater should give you the chance to see a variety of wildlife. You can enjoy a picnic lunch on the floor of the crater. In the afternoon you will continue with the game drives, safari walks, birding and whatever else you might want to do. The scenery alone is breath taking, so be sure to carry your camera. the park is quite obviously named after Lake Manyara. It is one of the smaller parks in Tanzania, but its size doesn’t mean there is very little to see. Lake Manyara national park has a variety of wildlife and an impressive population of birdlife. It is famous for its tree climbing lions and has several other large mammals that you will see on a game drive though the park. If you are hoping for a rich birding experience while in Tanzania, Lake Manyara is just the right place. The lake shores are full of birds of different kinds, and so are the trees, and the escarpment cliffs. Day eight will be spent exploring and enjoying the beauty of this small park. on day nine, you will be picked up from your hotel or lodge and taken back to Arusha and then the airport so you can board your flight home. That will mark the end of you 9 day Tanzania safari holiday.